Purchase our comprehensive study guide for $9.98 with the complete 7 chapters to increase your chances at passing the food handlers certification test. Get your food handlers card the first time! 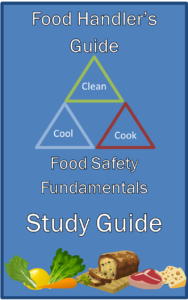 All of the key points of food handlers safety can be found in Food Handler’s Guide: Food Safety Fundamentals Study Guide. Focus on common food borne illnesses all food handlers must become knowledgeable with in order to receive a food handler’s card and safely serve patrons without putting them in danger. Focus on handling raw ingredients from suppliers to safely storing until cooking for customers. Knowing the risks and correct food preparation processes will ensure you pass the the test and receive a food handler’s card.